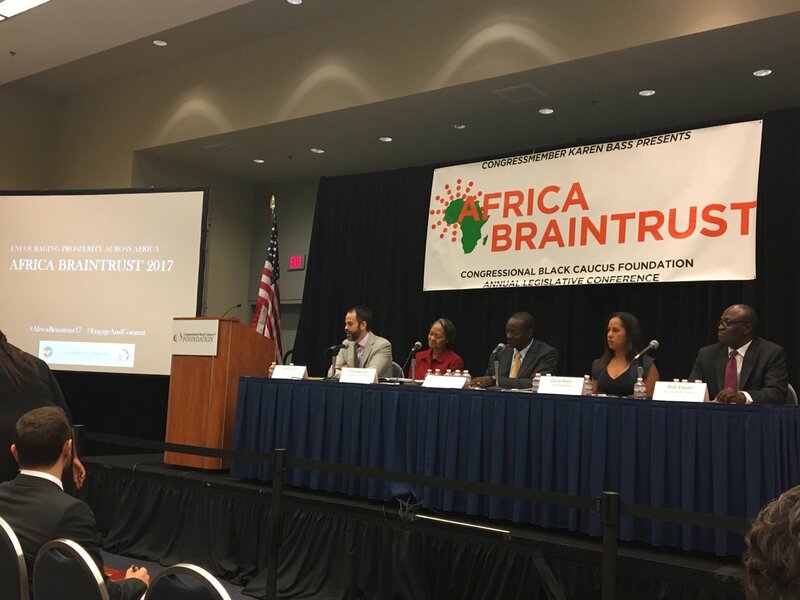 This year’s Africa Braintrust was held on September 22nd as part of the 2017 Congressional Black Caucus. The event was aimed at exploring the various ways the United States can renew and strengthen its engagement with Africa in the domains of economic investments, cultural exchange, democracy promotion, education, and scientific research. Much attention was, however, given to U.S. policy toward Africa, as well as discussions on many of the challenges facing the continent. This year like years past, the event was championed by Congresswoman Karen Bass, a Democrat from California. This year’s theme of “Renewing Our Commitment and Engagement with Africa,” she said, was chosen because the Congressional Black Caucus is taking a hard look at where Congress stands with Africa policy and sadly acknowledged that she does not know where the Trump administration is with regards to Africa policy. She expressed concern that the administration has done away with the special envoys at the State Department and also the proposed budget cuts will poorly effect African countries. However, she expressed gratitude that through a bipartisan agreement, the majority of these budget cuts were rejected. She added that during the last budget crisis in July, Congress was able to pass a continuing resolution that will provide close to one billion dollars of aid for countries that are experiencing famine in Africa, such as Somalia, South Sudan, and Nigeria. She pledged on behalf of the Africa Braintrust to remain committed to African issues and countries; this is in addition to the Congressional Black Caucus continuing its Africa policy breakfasts to make sure these discussions continue. Panel discussions centered around fostering prosperity, growth, and good governance in Africa. In spite of security challenges in Africa, there is growing hope and optimism seen with an increasing middle class, growing infrastructural investments, and the witnessing of institutions working when elections fail like those recently experienced in Kenya. Congresswoman Bass generously stated that Africa has shown commitment to just governance at the institutional level through reform. In this regard, ECOWAS leadership and presence in the defense of regional democracy was hailed both by Liberian President, Ellen Johnson-Sirleaf in her keynote address and some panelists for their timely intervention in a peaceful political transition in The Gambia. In fact, Gambia’s president Yahya Jammeh lost elections he organized on December 1, 2016, to the opposition candidate Adama Barrow. He initially conceded but later refused to step down on December 19 as it is stipulated by the Gambian law. Eventually, the rightful winner was inaugurated as assumed office in January 2017. Africa’s prosperity was also highlighted during this event. It was argued Africa must diversify its investments, moving from providing raw material to transforming it before sending it to markets. Furthermore, African countries lose immensely by not trading with one another, an obvious economic model vital for the growth and prosperity of the continent. Similarly, there was an emphasis on the importance of the role of the Diaspora which is one of the continent’s assets; the U.S. government is looking at how to harness and leverage their skills. This event has been held annually for more than five years. To watch the event, please click here.